High quality heatsinks with super sharp edges for the mounting of high power laser diodes. Typical outlines are Q, W and C mounts. Q and W mount heatsink bodies are typically made from vacuum infiltrated 90/10 W/Cu, which has low thermal expansion (CTE 20-300°C = 6.4 x 10-6 ppm/K) and high thermal conductivity (TC = 185 W/mK). 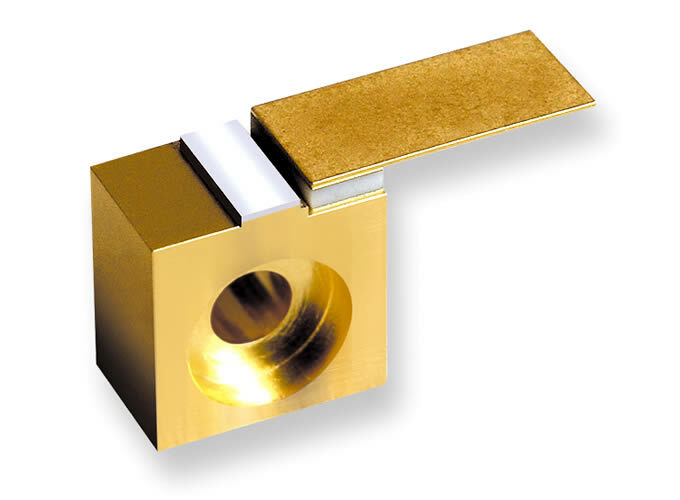 C mounts typically have a W/Cu insert brazed to a Cu body. To ensure the best performance for producing sharp edges and ensuring reliable coatings it is imperative that the raw W/Cu material is highly homogeneous. Vacuum infiltrated W/Cu is normally essential, as it does not usually suffer from the problems of agglomerations of un-sintered W powder, which can prove problematical with powder metrology (pressed) type materials. To allow the laser die to be mounted right up to the edge of the heatsink requires edges of the highest possible quality. This requires very good quality material and also high quality machining. 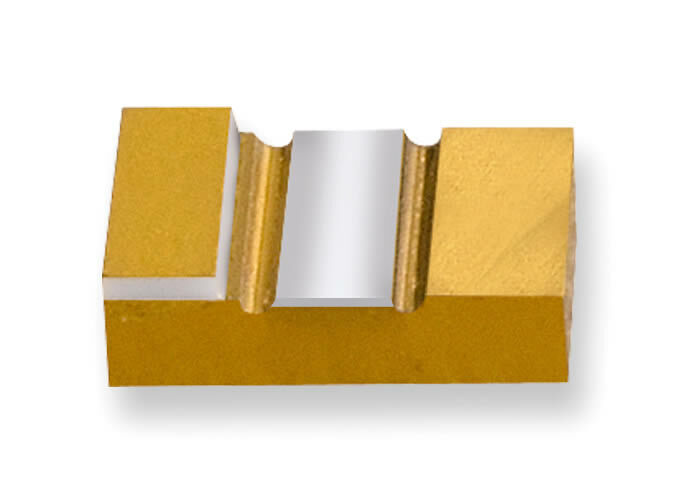 Edges are supplied with <5 micron radius and with <5 micron long chip outs. It is important to apply coatings that do not compromise the sharp edge and smooth flat surfaces that have been carefully created, but that also properly encase the heatsink material and provide good wetting and solder barriers. The metallurgy of W/Cu can lead to problems with traditional electroplated coatings and thus LEW supply high quality vacuum sputtered coatings. Typically coatings on the heatsink are Ti/Ni/Pt/Au. Maximum laser performance requires high quality joints between the laser die and heatsink. Correctly applied pre-deposited AuSn solder layers ensure minimal voiding and thus minimise thermal resistance between laser die and heatsink. To ensure the best reflow and wetting the ratio of Au to Sn is adjusted to account for both the Au in the heatsink coating and on the underside of the laser die. Typical pre-deposited solder ratio is 76 Au/24 Sn, selectively deposited at 3.5 – 5.5 microns thick. 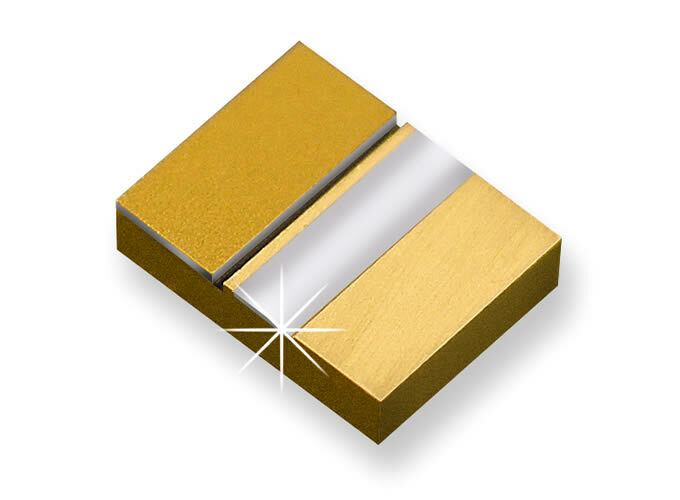 The AuSn layer is typically covered with a thin Au coating to protect the solder from oxidising and maximise shelf life. 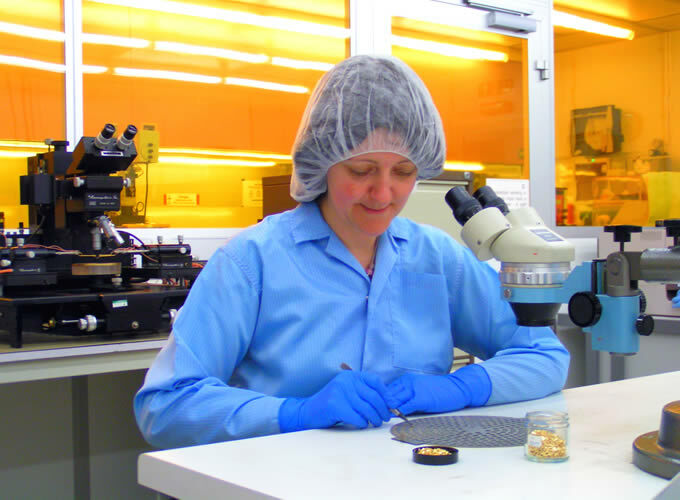 The solder layer can also be wrapped over the critical edge to aid solder wetting and minimise solder balling in front of the laser facet. Metallised standoff ceramics are attached to the heatsink using AuGe solder (before pre-deposited AuSn is applied). The strength of the metallisation to the ceramic and the AuGe soldering is critical in ensuring reliability of the heatsink assembly. This is especially important where plated copper tags are attached to the standoff. Typical metallised standoffs 2 mm² have shear strengths greater than 20.0 kg (5kg/mm²). Typical copper tags (2 mm wide) have peel strengths in excess of 1.5 kg. A selection of standard outlines are available suitable for various laser die lengths. It is also possible to modify standard outlines or manufacture bespoke designs as required. Use the links on the left for details of our comprehensive capabilities for manufacturing AlN laser diode carriers, laser bar mounts, photodiode mounts and other optoelectronic and RF related products.